This fall, six Point Park University School of Communication students spent their Friday nights working behind the scenes with the AT&T SportsNet production crew for high school football broadcasts. The students saw firsthand what it takes to put on a live sports production from start to finish. They attended pre-production meetings with producers and on-air talent at the AT&T SportsNet offices on the North Shore ahead of the weekly broadcasts. 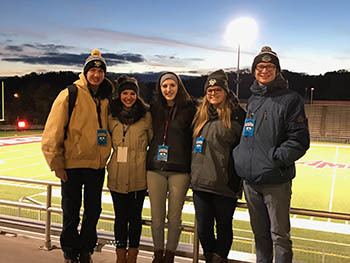 Every Friday night, they traveled to a different local high school for the AT&T SportsNet game of the week through the conclusion of the season at Heinz Field for the WPIAL championships. The crew welcomed the students hours before the broadcast to run through the process of preparing for a live broadcast. During games, the students shadowed crew members and on-air talent in the broadcast booth and the production truck for an up-close look at the live broadcast.